Miss Appleton at dinner. She has lately published a book on the Early Education of Children which she has dedicated to the Duchess of Kent and having received a visit from Gen [blank] on the part of the Duchess about a fortnight ago, has been in high expectation of being summoned to attend her Royal Highness and perhaps her flattering fancy may have given her an establishment in her Royal Highnesses household. She has now received a Letter from Capt. Conway commanding her attendance on Wednesday. What will be the result? Where besides the Duchess were the little Princess seated on a piece of Tapestry, the English Nurse attending her and other Attendants standing round rather in Scenic Order. She was most graciously received and had perhaps half an hour’s rather familiar conversation. …given to the Child on the Carpet who appeared delighted with it but began to pull its head-dress and cloathing as made Miss A apprehensive that its drapery which she had taken so much pains with would be destroyed before her face. 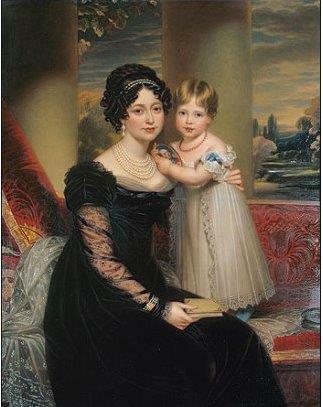 Painted a few years later, this portrait of the duchess (still in black) and her daughter, by Henry Bone, gives an indication of how the Duchess would have looked. Unfortunately for Miss Appleton, the book dedication and her visit didn’t result in a job offer. Given the fact that she subsequently opened a highly profitable school, she perhaps didn’t mind too much in the end.